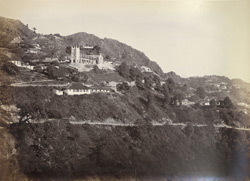 This photograph shows a view of the Himalayan town of Mussorrie taken in 1865. Mussoorie became a hill-station, or British Colonial resort, in 1826. In 1827 a sanitorium was built at Landour, which later became a large cantonment, or permanent military base, and Mussoorie and Landour eventually grew togther to form a single town. Colonel Everest, the Surveyor-General after whom Mount Everest was named, built a home in Mussoorie in 1832 and also opened the Survey of India office. As a large number of children spent the greater part of the year in Mussoorie it became a centre for education. Many of these schools are still in existence today.